I love a nice strong coffee when tapping away at my laptop. All that caffeine keeps you going for hours and gives you that essential sugar rush. So this item caught my attention. Believe it or not, these coffee beans have been regurgitated by rare Vietnamese weasels! Once the weasels have boked the beans, the local villagers collect them and sell them to wholesalers! Apparently, with all the gastric juices in the weasels’ stomach, this coffee is strong and smooth. When you put it that way… I’ll not bother thanks! The next time you have guests over, give them this coffee don’t mention it. No doubt they will say ‘Oh, that’s a nice coffee, is it Nescafe?’ to which you would reply ‘No, weasels have eaten these coffee beans and then spat them back out, got them off the internet’. Although you may want to tell them after they have drank it, don’t want anyone spitting it out on your good carpet do you! Seriously, I don’t think I will look at weasels or indeed coffee in the same way again. Although regurgitated coffee beans sound delicious (not), I don’t think I’ll be drinking it anytime soon. If you’re worried about germs, don’t worry, its sterilised. I would buy it for other people though for a laugh. Good gift for someone in the office, I’m sure you would have a laugh giving one to oblivious work colleagues. Probably is nice coffee, why else would it sell. Quite pricey for coffee, it’ll cost you £15.95 which is understandable I guess, considering the process! Go on, take Sainburys’ advice and ‘try something new today’! LOL — they’re Indonesian civets, not quite Vietnamese weasels. It’s funny how things mistranslate in this online game of telephone. actually this is different to the Indonesian civets coffee. Translation is perfectly fine, the only thing wrong is the amount of exploitation required to make such a niche coffee. Free trade all the way! The animal in question is in fact a civet often mistaken for a weasel. The coffee is also deficated rather than regurgitated. Trung Nguyen’s Coffee Legendee(Weasel Coffee)is said to use a enzyme based wet processing that is suppose to mimick the processing that coffee goes through in this creatures digestive tract. This is not the real stuff. 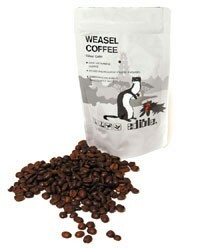 Go to wikipedia and type in weasel coffee and you’ll see why. This coffee is extremely rare and is quoted at over $300 U.S. per pound and sold for around $50 U.S. per cup. Very unlikely that this is the same product. Wikipedia isn’t really a relible source nowadays. This brand though goes for $30 US for 2 ounces (57g) and a can of coffee is usually 15-16 ounces (1 pound) or 400-450gs. So if you want to talk about price, this then is the real deal.